We have some catching up to do! We have spent the last two weeks on a massive road trip with two dogs, a 3 month old and a packed Honda Fit. If to you this sounds like one of those comedies that is just so ridiculous you have to laugh at it, then you have a general idea of how our life has been. There was laughing, crying, teething? ?, and lots of visits with friends and family. The trip ended in a last minute decision to just get home, so we got back late last night after 32 hours in the car (with stops). We learned so much on this trip so as we share parts of our trip, we'll also be documenting the things that worked and didn't work along the way. So you ready for a trip? Here we go! We had a rough first day of traveling... to the point that I was ready to nix the whole trip. The main issue was that we kept forgetting things at the house even though we thought we had everything. This resulted in a really late start to the trip and that along with hitting traffic meant that we made it only about an hour and a half before Will woke up from his nap. Our first planned stop ended up being our third which meant that we got to see a 2000 year old tree, but also meant that it was a fight to keep Will happy for the rest of the afternoon. It didn't help that for pretty much the entire trip (except for the short periods that we stopped) it was down pouring and storming. We made it to Savannah, Ga the first night (Will's first new state!) after stopping about every 1-1.5 hrs for about an hour. We decided at that point that we had to do something different if we were going to make it the rest of the trip. The next day and future travel days went so much better because of tip #1. 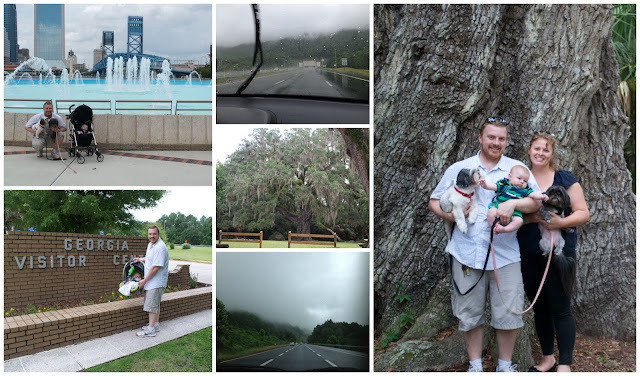 We stayed in Savannah, GA the first night and while I really would have liked to see it, the weather had other plans so we packed up the car right before we went to sleep and when Will got up for his 5 am feeding, we stuck him and the few things we had left in the hotel into the car and hit the road. Will normally sleeps until 7:30-8 am after his early morning feeding and since we had the vibration of the car on our side, he made it until 8:45 that morning. We also started spending a full hour and a half at each stop and really trying to wear Will out during that time. If we did that, he would be ready for another nap and we would be able to drive for a few more hours. We repeated this throughout the day and despite the continuation of horrible weather, we skipped our next stop in West Virginia and made it all the way to our first destination, Pittsburgh. It took about 14 hours to drive which was pretty good since it would have been 10 if we hadn't stopped at all. Compared to the day before it was amazing since that day it took 8 hours to go a 5 hr trip and there was significantly less screaming. Since we got into Pittsburgh early, we were able to spend some time with Nate's family before his cousin's wedding the next day. We were able to grab back our hotel room that we had cancelled a few days before (thinking we wouldn't make it to Pittsburg) which meant that we were in the same place for three nights which was amazing. Will normally sleeps in his little rocker which we brought with us. We had been warned that babies don't like to sleep at night when travelling and while Will would be ok for the first little bit of the night, he did have a hard time staying asleep after that point on a few key nights. We don't co-sleep with Will but we did make an exception on this trip and it was a life saver. He slept really well if he was with us and that made the trip bearable because that meant that we got to sleep as well. We got a king at every hotel we stayed at so that we would have plenty of room and I didn't worry as much about suffocating Will. 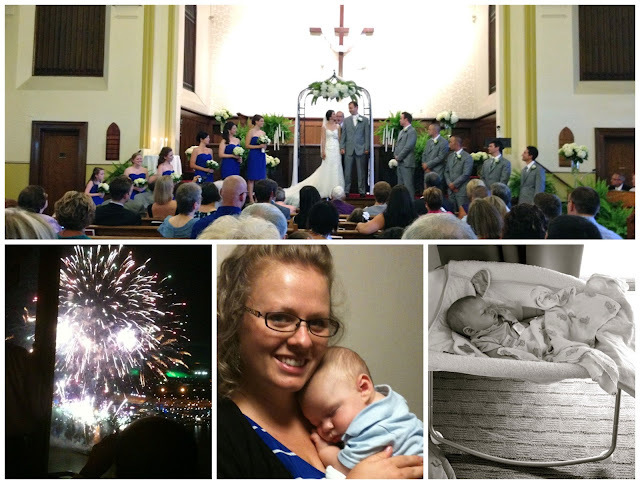 The next day, Will was great at the wedding. He slept through the ceremony and was really pleasant during the reception. Nate's cousin on the other side was able to watch the dogs for us so we were able to enjoy the wedding and the fourth of July fireworks. The reception was so high up on the hill that we actually looked down on the fireworks. Our second day in Pittsburgh was nice and relaxing. We had brunch at Nate's Aunt and Uncle's house, had some down time and then went on a Duck boat tour of Pittsburgh with Nate's family. 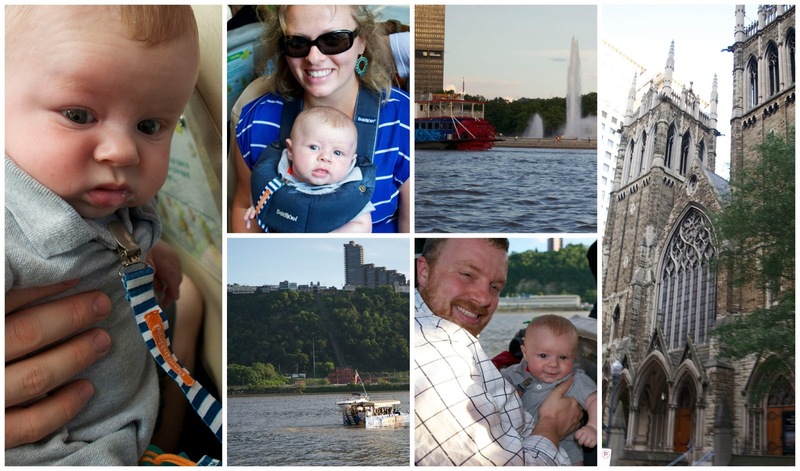 It was fun to see Pittsburgh in that way but it was not car seat friendly. There is no space at all in the interior of the boat and the one section that did have room to even put it on the floor was occupied with a group of people who refused to move for anyone (and even got into a verbal altercation about it with another woman before we got on the boat). Luckily, Will woke up right when we got on so we held him and awkwardly stuck the carseat in the seat next to Nate. We headed to bed right when Will went down that night since the next day we were on to Part 2 of our trip.